The Interface page allows you to change settings relating to the look and feel of the software, including actions that happen when calls take place. Displays a license type the Go Integrator Client uses. To have the software start automatically when you log on to your computer, put a tick in the "Application load" tickbox. The setting will take effect next time you log on to your computer. Language packs are available for the software to change the language of the user interface. By default, the software will attempt to automatically select the language to use based on the language setting of your operating system. However, you can change the language used by selecting from the Language dropdown list. If your language is not in the list, contact your reseller to find out when it will be available. Any changes you make to the language will take effect next time you start the software. You can turn on or off the unobtrusive Preview window for all calls by ticking or clearing the appropriate box. The "Hot keys" section allows you to setup keys on your keyboard and associate them with the following actions: Call (number must be highlighted in order to dial), Answer and Hangup. 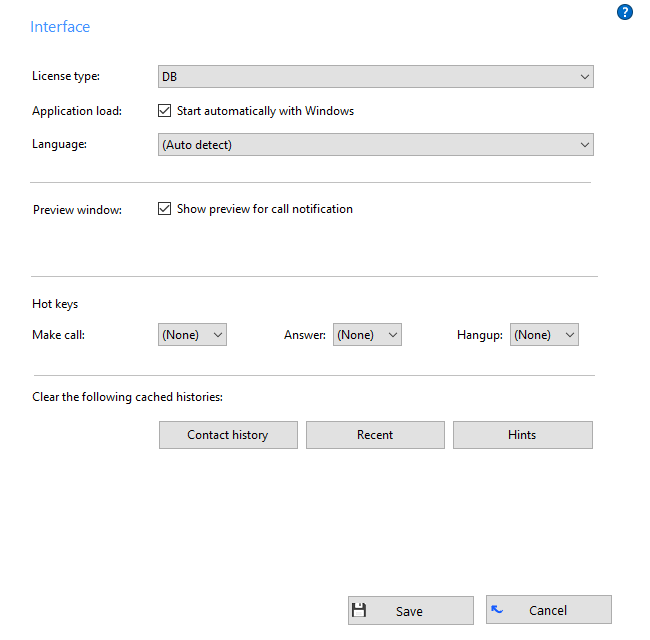 The last section of the Interface page has buttons you can press to quickly and securely perform certain actions: clear the history of all CRM contacts from your call history, recent numbers (as shown in the Recent list), and which hints the software has shown you (clearing hint history allows the software to show you the hints again).